Do you ever play that desert island game where you decide which cooking ingredients you couldn’t live without if you were marooned like Robinson Crusoe? No? Just me and sister-in-law Sarah, then. Onions would have to be high on my list, I’d struggle to cook without the allium family. Salt, too, but I’m assuming I’ll be able to make my own with all that seawater surrounding my atoll. And although I love the heat of chillies, at a pinch, I could live without them. But citrus fruit, especially lemons, are kitchen essentials for me. They’re fabulous when they’re the star of the show (tarte au citron, mmmm) but they are also good in walk-on parts, their zest and juice lifting the most mundane dishes. 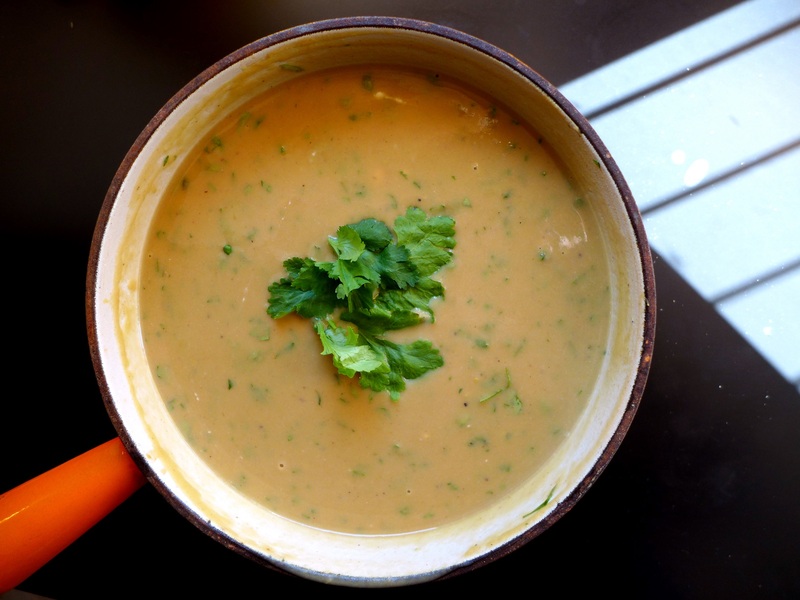 I’ve used them three ways, zested, juiced and pickled, as the not-so-secret ingredients that add last-minute freshness to this soup, stopping it from being too sweet and cloying. You can leave out the pickled lemon if you don’t have any or don’t like them, the soup will still taste good. 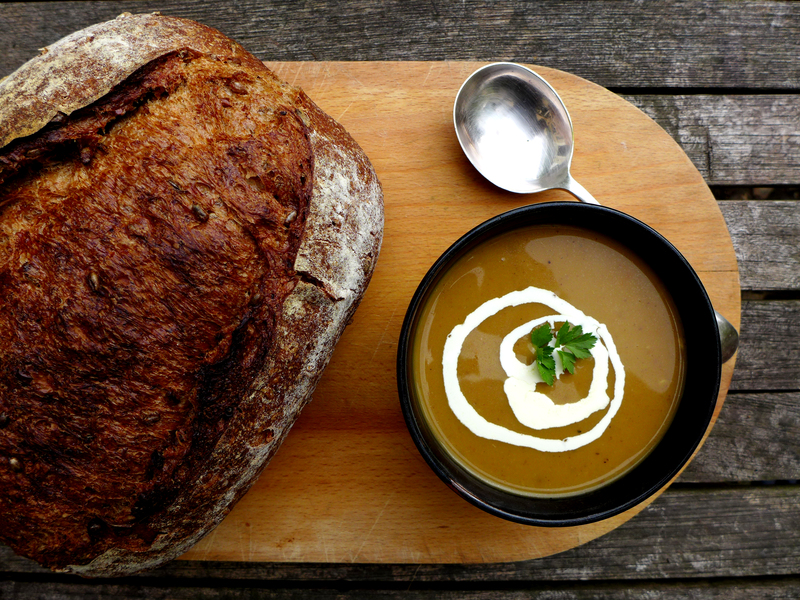 Velvety and comforting, it is equally at home served for lunch, in big bowls with hunks of country bread (like the enormous loaf from Will Wooster, pictured below the recipe) or with a swirl of yoghurt for a more elegant starter. Peel and de-seed the squash and cut it into chunks. Toss with 1 tbsp oil, salt and pepper and roast for 20-30 minutes, until soft and browning at the edges. Heat the remaining oil in a saucepan and gently fry the onion and celery, stirring from time to time, until soft and tinged with brown. Roughly chop the chestnuts and add to the pan with the roasted pumpkin. Chop the pickled lemon, if using, skin and flesh, picking out any pips. Add to the pan, stir, then add the warmed stock. Bring to the boil and cook for about 20 minutes or until the flavours have melded and you can squash the pumpkin and chestnuts against the side of the pan. Remove from the heat and once it’s cool enough to handle safely, liquidise it until smooth, sieving out any lumps if necessary. Return to the cleaned pan, adding more stock or water if the soup is too thick. Re-heat, adding the zest and juice of about half a lemon, to taste. Stir through the chopped coriander, if using. Check the seasoning before serving, swirling it with a little yoghurt or cream if you like. This entry was posted in Soups, starters and canapes, Vegetarian and tagged Pumpkin and chestnut soup by Linda Duffin. Bookmark the permalink. Lemon! it has to be lemon for me… invaluable in the kitchen and a joy to look at, especially during winter. Good soup: I play endlessly with these ingredients over autumn and winter, using them from soup to tarts. Sometimes I have made a more brothy version of this soup: chunks of roasted pumpkins, chestnuts warmed up in butter, croutons, over which I then ladle good beef broth and lots of parmesan. I love chestnuts and I make the point of using them often during the cold months.Few weeks ago I was in Milano and I saw (pretty early actually) the roasted chestnut sellers in the Duomo Square: beautiful, huge, roasted chestnuts – one of the treats I miss mostly from Italy. Having said that, I am so grateful that we can buy already cooked chestnuts, that work so well in this type of dishes (and in dessert too..). Your version of the soup sounds divine … I always have to disguise pumpkin in my house because my husband isn’t fond of it (he doesn’t like pasta either but I love him anyway). I’m kicking myself for not buying fresh chestnuts when I was in Spain at the weekend, they’re so much easier to source there and I succumbed to a new chestnut roaster during the trip. And yes, Will’s bakery is brilliant, a big favourite with lots of happy customers here in Suffolk. I love butternut squash and I love chestnuts but I’d never thought to put them in a soup together. Genius idea! Mind you, I do loathe prepping the squash. This looks good. And if I lie about the name, I think I could get it past chestnut-hating ‘im indoors. Yup, lemons on my desert island too. It’s too difficult a game to play just now. 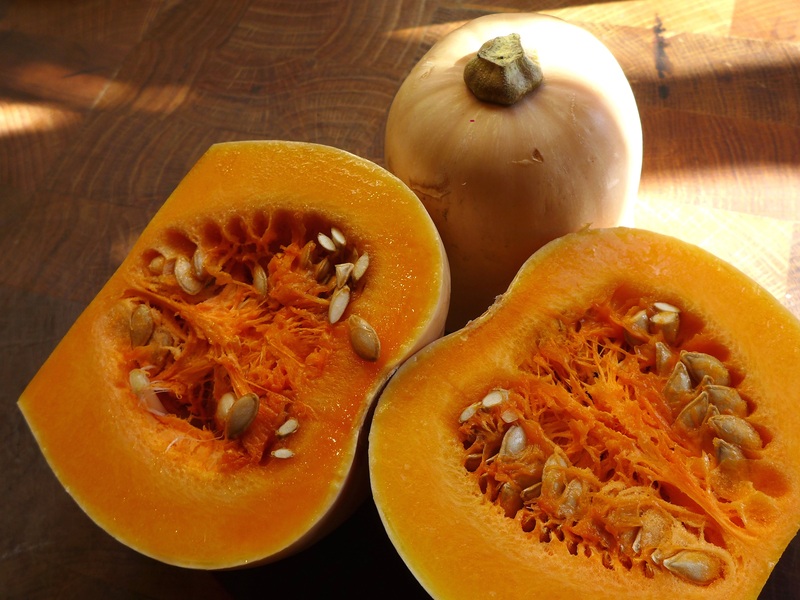 I’ll think about the other seven …..
Once again, you have e salivating over flavors ( pumpkin, winter squash) that are not usually my favorite…lemon seems like a brilliant addition, to act as counterpoint to the sweetness of the squash! Yes, onions or garlic would make it on to that desert island. I don’t think coriander would, but I do like the idea of adding to this lovely soup.